If you're reading this, it means you're here for the technicals and get an explaination of some of my technical choices. If you did not already, I suggest you look at Fredrikaa's post about steemgifts. Note that the project is open source so you can red the source code as you go. It's a good question, and probably the one that's gonna get asked the most. Well it's for a simple reason : steemconnect doesn't have an api for account creation(yet) so if we wanted to integrate everything within the same website we had to ask for the active key. 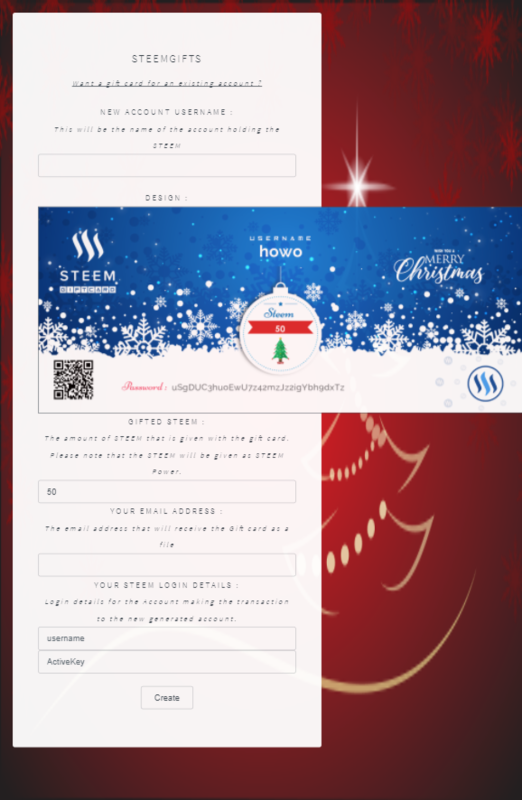 Trust us we would have used steemconnect if we had the choice, we even created a steemgifts app (aka an account) for 6 steem which makes us sadder every day with the price going up. But in the end we wanted to make the process as simple as possible. so we ended up going for the account creation with no delegation and with everything powered up. What modules do you use ? Why don't you display the image when you're done ? If I display the card image directly, it means that anyone can access it, and I can't take that risk. In future versions if we have a login system why not. But for now it's a no. Love the idea and I'd really like to take a look at the code. All the links seem to be broken though - could you point me in the right direction? Amazing work. You finally completed it before Christmas. At least we are able to see the concept. Great job. However, there are some bugs, which I know you'll sort out soon. I am really happy to be a part of this project. Ah yeah responsivness, my old nemesis ^^ Might fix it later. How do I get a giftcard?